My mother was given a demitasse china tea set by her aunt when she was a young girl. That darling little set lasted for decades. I loved pouring tea and milk, spooning sugar, and drinking from the dainty white and gold cups. Sometimes it was herbal tea, other times lemonade, or hot chocolate (at my grandparent's, right before bed, always with cookies). I had tea parties with my grandparents, aunts, mother, friends, and siblings. I have three sisters and we all have these same, wonderful memories. My mother encouraged us to keep this tradition in our own families by passing along heirloom tea sets, owned by our great-great grandmothers and aunts, to each of us. Long before I had children, I had a box in my attic, tightly packed and labeled "Taryn's Tea Set." 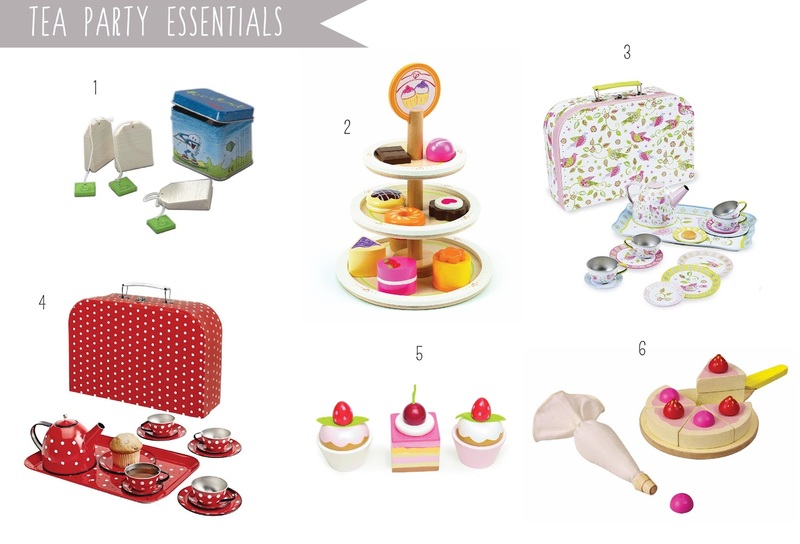 There are so many different ways and reasons to throw a tea party. With a little effort and the right accompaniments a dull afternoon can be transformed, and you may just start some traditions of your own. We're thrilled to share some of our favorite tea party essentials and stories to go along with them. What's tea time without tea, the wooden tea bags from Haba are perhaps our favorite tea time item, and happen to be a big hit with kids of all ages. Of course tea and pastries go hand in hand, and a treat tower is sure to impress guests, real or of the imaginary variety. I treasure my heirloom tea set and look forward to many a tea party with my daughter, but while my daughter is little I'll go the tin tea set route and these two with their carrying cases are top contenders. Petit fours and cake round out our essentials list. Published in the early 1979's and winner of the Caldecott Medal, May I Bring a Friend is an often forgotten classic. About a little boy who brings his most unusual friends to tea with his royal friends. In Tea Rex, Molly Idle's detailed illustrations shine as a girl and her little brother try to host a tea party with a not quite civilized T-Rex as their guest. 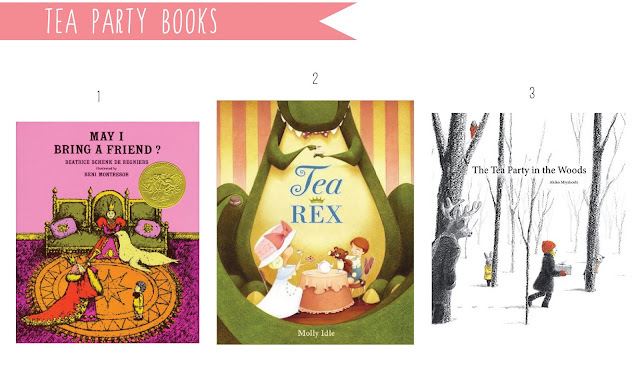 The Tea Party in the Woods, named one of the best picture books of 2015 by Kirkus, follows Kikko through the woods as she takes a detour to a dreamy tea party hosted by woodland animals on her way to her grandmother's house. 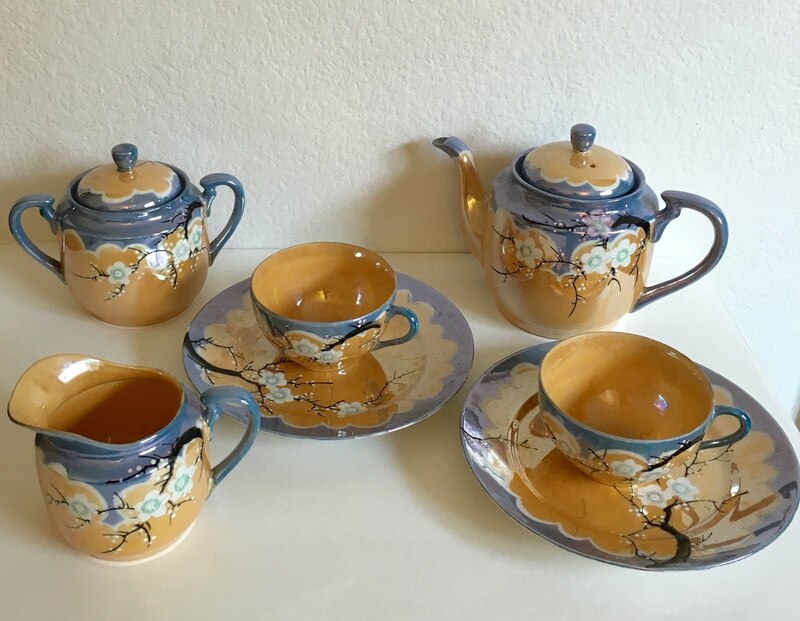 For a few vintage options check out our Tea Set Pinterest board!